The 4-patch block. 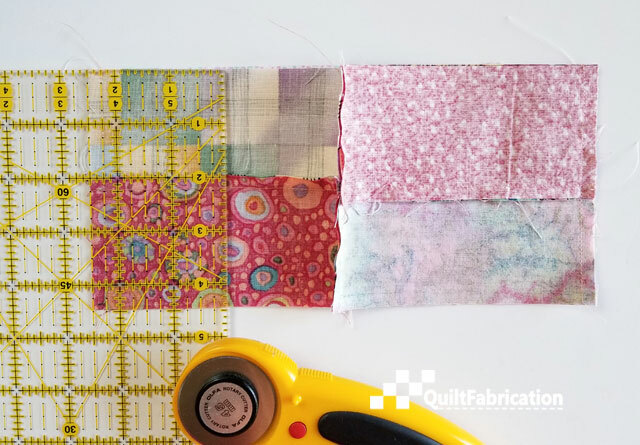 One of the basic and useful building blocks in many quilt designs. And today, as promised, I'm going to show you a fast, fun way to make them from charm (5") squares. I know, you're probably thinking, well, duh, just sew those charms together. That's great if the quilt needs a 9 1/2" unfinished 4-patch block. But no, I want a 4 1/2" block. So, you say, cut the charm square in half horizontally and vertically, and sew together those 2 1/2" squares. What I have to show you today will rock your world! You'll see how to sew those charms, do some cutting, rinse, repeat, and end up with 4 1/2" four patches. And for a special treat to explain this process, I not only have pictures that show the making of scrappy 4-patches, but also an animated video of the process using black and white. Ready to see the magic? We're going to use 4 charm squares for this demo. For you overachievers, I have a demo using 8 charms - The Charming 4-Patch - On Overdrive! Sew those charms together in a row. I've got four rows of four in this picture. Sew the ends of one row together to form a small tube - that's at the bottom of this picture. Line up a cutting ruler at the seam and the 2 1/2" mark. Cut, then do the same on the opposite seam (right side), so that now there are four pieces - those on bottom. Pair these units up with different units if going for the all-over scrappy look. We're looking for variety here, with no two blocks identical. 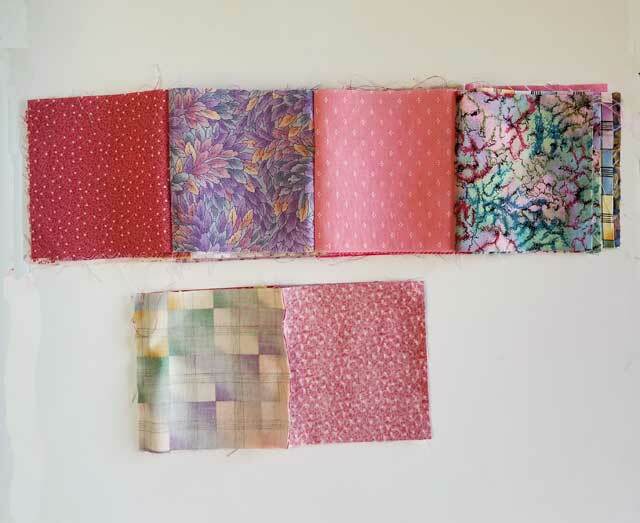 There will always be two blocks containing the same two fabrics from those sewn together in this first step. And that's ok. You'll see what I mean later. Now those block unit pairs get nested together and sewn along the short side. Then the pairs are sewn for another long row. Did you guess what's next? That's right - sew the ends together to make a tube. and 2 1/2" inches from the right seam. Open or flip over, and take a look! 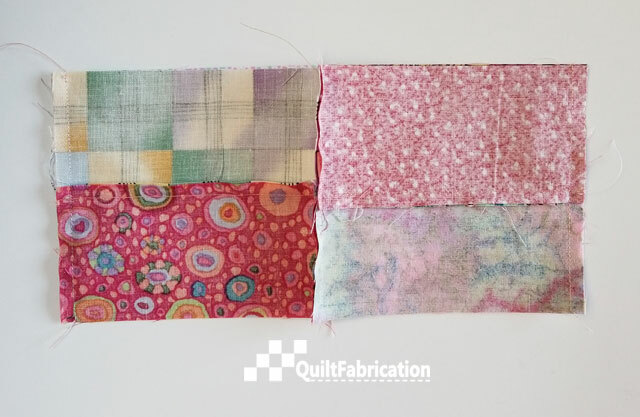 Four fabulous 4-patch blocks without having to cut or sew a single 2 1/2" square. How awesome is that??? And notice the variety. 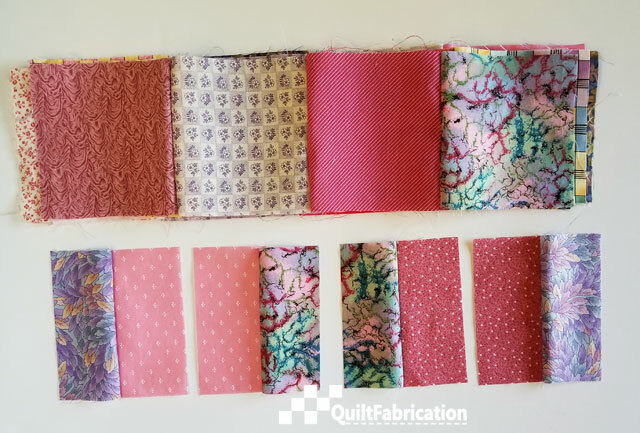 Repeat fabric combinations occur in just two blocks (unless the same two fabrics get sewn together as another pair! ), and that's it. Total scrappy! And as I was told in a scrappy quilt class years ago, don't over-think it! Now, what if the charm stash contained two colors? Then this is a fantastic way to make a checkerboard pattern with them! Have a look at my Youtube video of the same process using black and white charms - I think you'll see the merit of this technique. By the way, this is not limited to using charm squares! Want to use a layer cake instead? 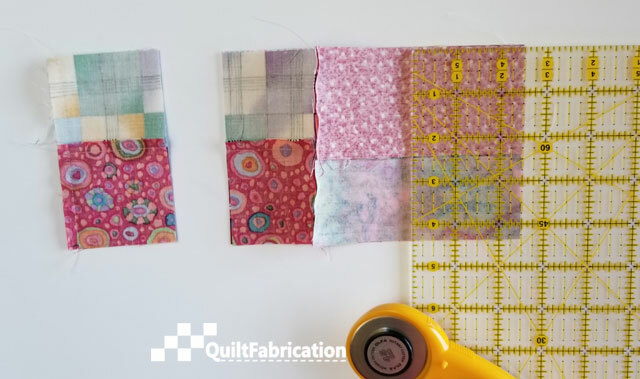 Then follow the same steps to make a 9 1/2" 4-patch block. Or maybe a wee bit smaller? Eight inch squares make a 7 1/2" 4-patch; and 6" squares would make 5 1/2". Don't forget about 2 1/2" strips - they too can be used here, just like charms. 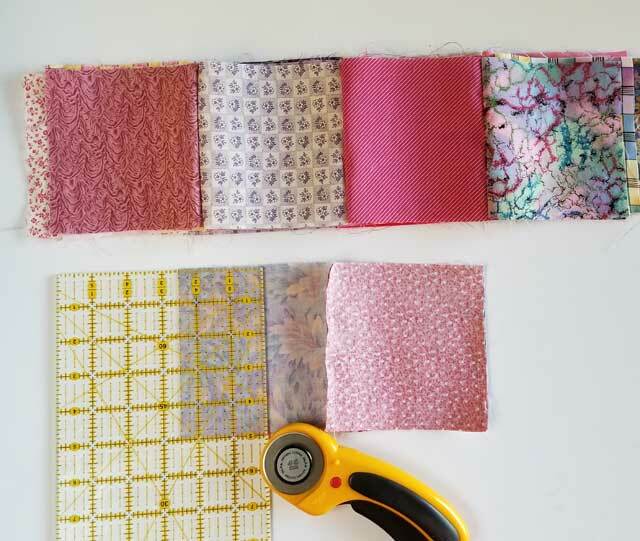 Give this a try on your next charm scrappy project - more next week! 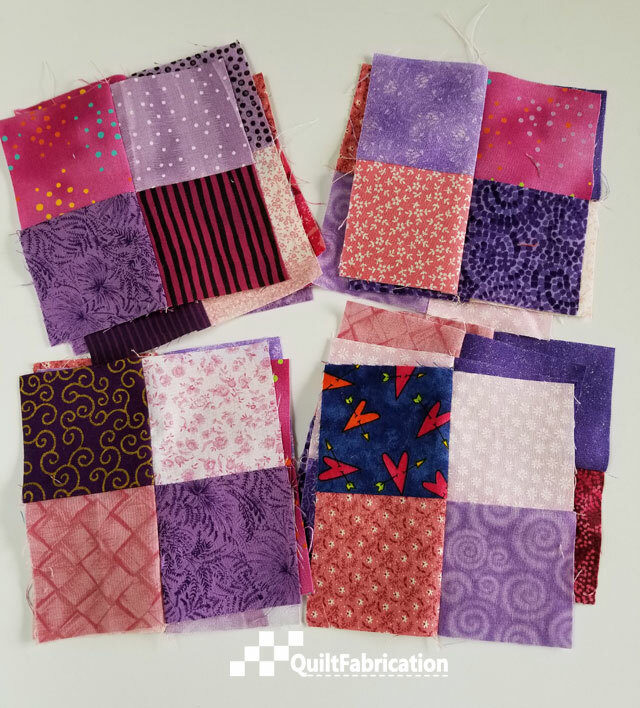 Share with your quilty friends! 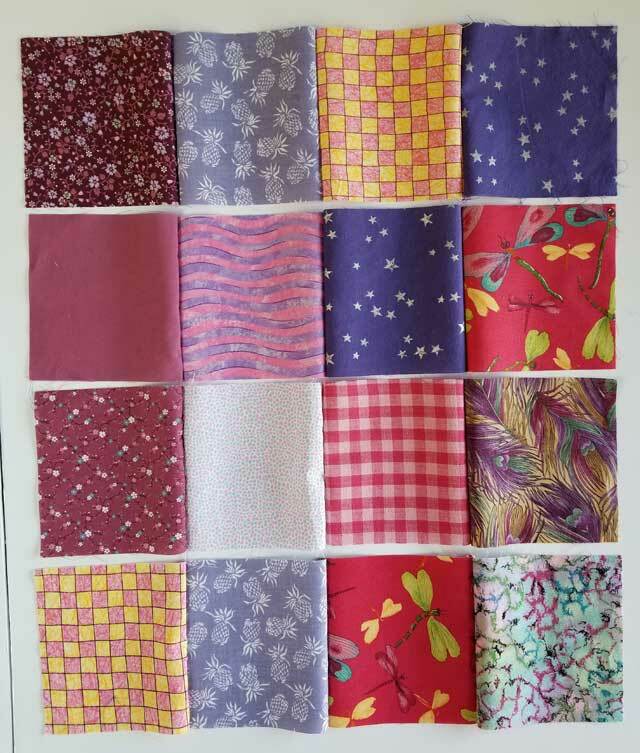 Now that is a clever trick, sewing 2 1/2 inch squares together is not one of my favourite occupations, thank you for that. So with you there! And thank you! Interesting technique!!! I'm going to have to give it a try. Share, share, share! Thank you - you're too sweet! Great idea! Am also pinning! Thank you! Very cool technique to create 4-patches. Isn't this just so fast, fun and scrappy, I just love fast, fun and scrappy. Can't remember where I saw it but it was the phrase something like "... more fabric than I can use in my lifetime" and had an acronym. Sure applies in my sewing room. Very clever and fun indeed!! Thanks for sharing this great idea! Sure would be a time saver for sure! I would have thought more of just cutting the first 4 in half if I would have tried to figure that out myself.